Mike Newman has a history of setting records. First he set a record at 186 MPH, in a Porsche. The he set a record of 93 MPH, in a boat. And now he just raised the bar past the 200 MPH mark, in an RS-spec Nissan GT-R. Oh, and he can't see anything at all. 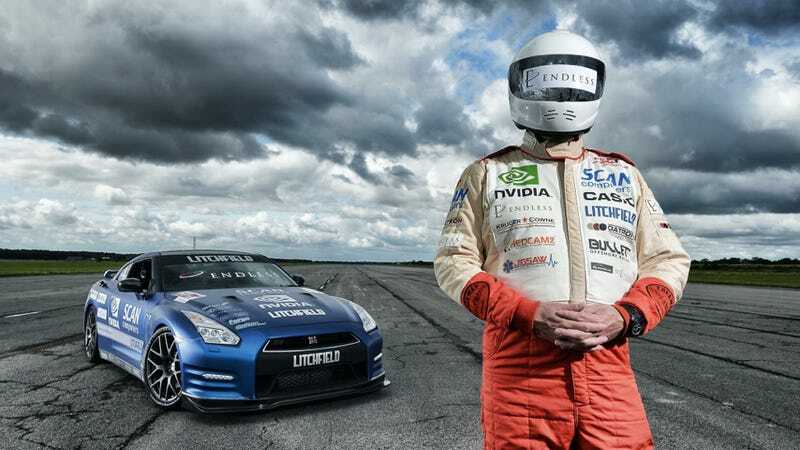 Litchfield Motors, which organized the run along with the Speed of Sight charity, asked Guinness World Records to authenticate it, clocking Newman at 200.9 MPH at the Elvington Airfield near York. Newman was born completely blind, which makes this all the more impressive. Do you know how scary it must be, to drive at over 200 MPH completely blind? I've never driven over 200 MPH, and I only need an ever-so-slight prescription, and I'd probably be a little nervous the very first time. Though we should be honest with the most impressive thing here, which is how they managed to fit what must be Newman's enormous pair of stones into a GT-R. Surely the Nissan is way too small.